Thirty years ago, Chattanooga was inching toward a renaissance with its downtown aquarium under development as part of a riverfront revival. With a world-class aquarium slated to help draw upwards of 1 million people a year to the waterfront, it made sense to find a way to move them around Chattanooga's long, narrow downtown, said Rick Hitchcock, a former CARTA board chairman. The solution, he said, was a fleet of downtown shuttle buses to transport visitors and locals. Over the past 25 years, CARTA's shuttle has carried an estimated 15 million passengers. "People take it for granted," said Hitchcock. "Every city doesn't have this. Dang, nearly no other city has this." On Thursday, CARTA will mark the startup of the shuttle two-and-a-half decades ago. Veronica Peebles, CARTA's communications manager, said plans are to keep two longtime mainstays of the shuttle system — no rider fares and its battery-powered buses. "It has been free since its existence," she said. "That's one of the reasons that makes it so unique, in addition to the all-electric fleet." CARTA in 2014 bought six new electric buses that were included into its fleet of 14, Peebles said. Total shuttle operating expenses in fiscal year 2016 were about $1.5 million, she said. Peebles said the shuttle is funded with the help of the revenues of CARTA's three downtown parking garages and some surface lots. Other monies are needed to help fund the shuttle's expenses, such as federal and state grant funding, according to CARTA. While carrying almost 1 million passengers just five years ago, ridership slipped to 826,000 last fiscal year, according to the transit system. Similar numbers could come in for the current budget year, which ends June 30. Peebles said that potential reasons range from downtown construction to the weather. Ridership on CARTA's regular bus service also is off, she said. "We're still exploring the reasons," Peebles said. While the shuttle expanded to the North Shore in 2007, there is also talk of running it to the Southside, such as down Main Street, she said. But, any expansion would need funding, Peebles said. Shuttle ridership is split pretty evenly between tourists and local residents, depending on the time of year, she said. Hitchcock, a Chattanooga attorney, said that when the idea of a downtown shuttle was raised in the late 1980s, it started out as a potential fixed-rail system. He said that putting rail into streets would have been time-consuming and the system wouldn't have been ready when the aquarium opened in 1992. Also, fixed rail means a fixed route, and there was uncertainty over the where the system should run, said Hitchcock. With a rubber-tire shuttle system, the route can be easily adjusted, he said. "Within a couple of weeks [after startup], we moved the route to serve the Trade Center," said Hitchcock, who served on CARTA's board for 20 years until 1999. 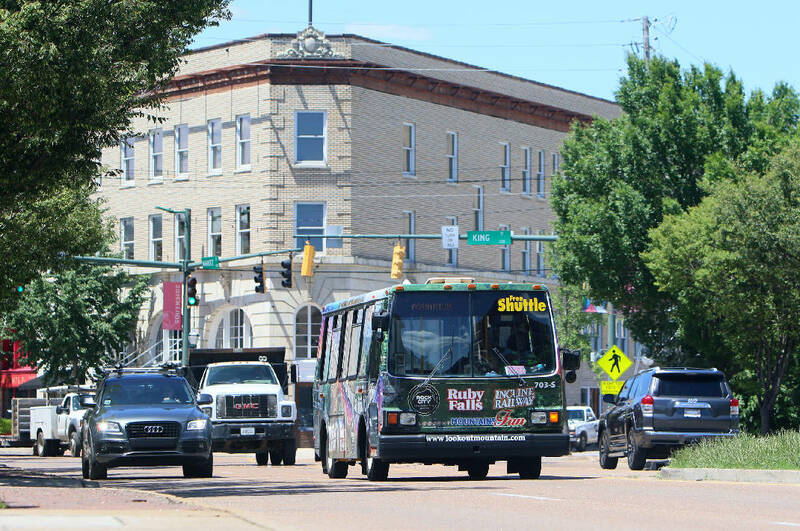 › On Thursday, CARTA will mark the 25th anniversary of the downtown shuttle at 11 a.m. at the Shuttle Park South parking garage plaza next to the Chattanooga Choo Choo on Market Street. › Also on Thursday, CARTA will take part in the 12th annual National Dump the Pump Day and offer free rides on regular transit buses that day. Meanwhile, the use of electric vehicles made the buses environmentally clean, quiet and pedestrian friendly with low floors, he said. However, before all the electric vehicles arrived, diesel buses were used on the shuttle route, the attorney recalled. "It was a delight to see people wait for a diesel to go by and wait for an electric bus," Hitchcock said. Today, he said, the shuttle is "a critical piece" of making downtown an attractive place not just for visitors but people who live and work in the central city. "That's the rewarding part of it," Hitchcock said. "Twenty-five years later, it's still serving and serving well the functions we thought were critical." He also cited the vision of longtime CARTA board members Steve Jett, who serves as chairman, and Joe Hutcherson, its vice chairman, and former Executive Director Tom Dugan. Peebles said CARTA will take part on Thursday in the 12th annual National Dump the Pump Day and offer free rides on regular transit buses that day. "We hope to welcome new customers who may want to try public transportation," she said, adding that people can save $9,800 a year by downsizing to one car.